Oct. 11, 2017, 12:18 p.m.
We missed you at ONA this year to talk shop about local news, fears around monetization, Facebook and other platforms, fact-checking, mobile design, social media best practices, women in media, and more. But not to worry, nearly every session was recorded and audio posted (see this list of resources ONA has helpfully compiled on its own site), and many attendees are writing roundups and useful post-mortems. — Nausicaa Renner of the Tow Center has a critical roundup for CJR here. — Jason Alcorn takes a look at how the question of finding better metrics loomed large in sessions ranging from how to build a newsletter to how to make a not terrible Facebook Live video. — Fiza Pirani from the Atlanta Journal-Constitution has a Twitter moment of takeaways and tips here. — Jake Grovum of the Financial Times ran a overflowing table talk on crafting good social headlines. He wrote up eight guiding principles that came out of the discussions here. — Fun ONA bingo breakdown from Justin Meyers. — Or, if you’re someone who prefers consuming things visually, Ayumi Fukuda Bennett has a few sketch-note roundups. — Amy Webb’s two reports — one on tech trends in journalism and media and another around the findings from a global survey on journalism’s “future” — are both now available to the public. 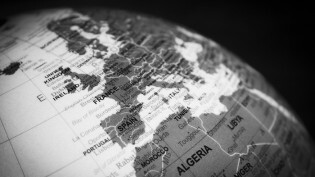 — ICFJ’s global report on technology in newsrooms around the world, conducted in 12 languages across 130 countries. Spoiler alert: The pivot to a digital-first mindset has been…slow. — Challenge Fund winners here. — The Online Journalism Awards winners, with a lot familiar projects (Electionland) and organizations (The New York Times, the Globe and Mail). Did we miss your roundup? Let us know and we’ll add it to the list! 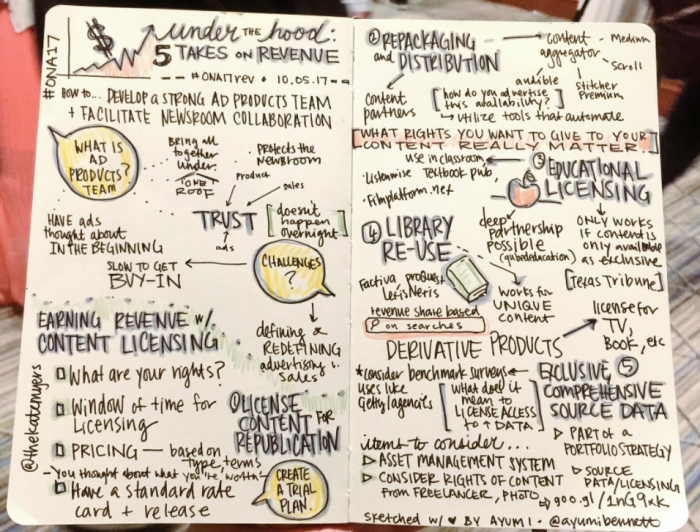 Sketchnote of an ONA17 session on revenue, created by Ayumi Fukuda Bennett. Used with permission. Wang, Shan. "Couldn’t make it to ONA this year in D.C.? Here’s a meta-roundup of roundups and resources for you." Nieman Journalism Lab. Nieman Foundation for Journalism at Harvard, 11 Oct. 2017. Web. 20 Apr. 2019. Wang, Shan. "Couldn’t make it to ONA this year in D.C.? Here’s a meta-roundup of roundups and resources for you." Nieman Journalism Lab. Last modified October 11, 2017. Accessed April 20, 2019. https://www.niemanlab.org/2017/10/couldnt-make-it-to-ona-this-year-in-d-c-heres-a-meta-roundup-of-roundups-and-resources-for-you/.